Download our Free Ethical Volunteering App! The Via Volunteers app includes everything you need for researching, applying and preparing for a rewarding ethical volunteer abroad experience in South Africa. 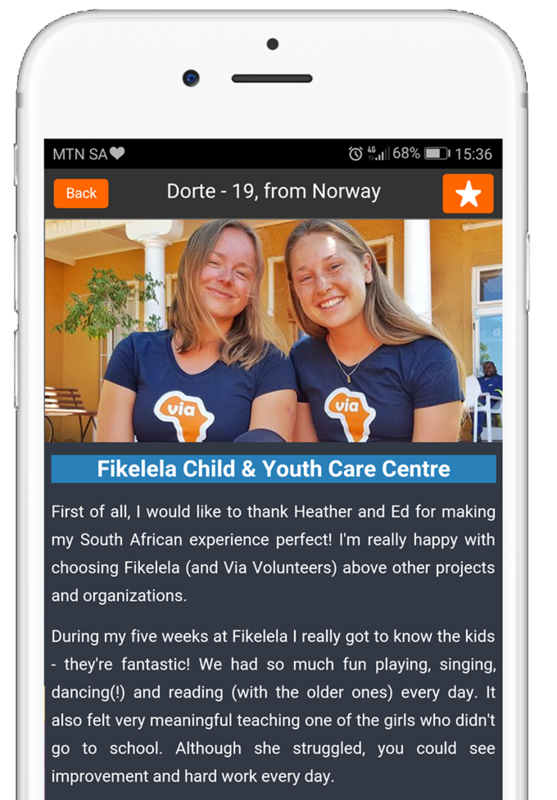 Whether you are looking for a short-term volunteering placement or want to combine two or more projects for a longer stay or a full Gap Year, this easy to use ad-free app will help you to create a volunteer experience that’s right for you. Our full range of ethical community, children, wildlife & conservation projects are included in this free app, with plenty of information to help you make an informed decision. Easily compare the main features of our ethical community, children, wildlife & conservation projects. Find details of what's included, 'good to know' info, volunteer fees in five major currencies, colour coded availability charts, and full volunteer project guides. Reviews are grouped together by project, so you can quickly find volunteer testimonials that matter to you. Learn from previous volunteers before deciding on your project choices. Complete one of our simple application forms for a no-obligation itinerary and quote. This is a great way to check everything before you decide whether to confirm your placement or Gap Year project combination. Practical, relevant travel advice for volunteering ethically in South Africa. Broad categories of frequently asked questions include Applying for a Project, Preparing for your trip, South Africa, Cape Town, Ethical Volunteering, and Via Volunteers. Create your own Bucket List from a wide selection of tried and tested activities and day trips in and around Cape Town. This a great way to plan and make the most of your free time in Cape Town. Activities are grouped under different price brackets to help you budget, from Free & Budget activities, all the way up to more expensive day safaris and helicopter rides. Every entry includes info about opening hours, costs, and useful advice about how and when to book, if required. Access the location map to find every item on your Bucket List, and rate them when you're done. This feature is a great tool for making plans with your fellow volunteers, and with our regular updates you will always have access to up to date information. Check out original photos from previous volunteers and the Via Volunteers team. All our children, community, wildlife & conservation projects are covered, along with various accommodations and a variety of Cape Town categories. Save time with our Volunteer Project Comparison Chart, and useful maps that you can use to locate projects and find your way to all the best attractions around Cape Town. Get a quick quote for Travel Insurance or send us an arrival photo so we will know what you look like after travelling all day. Connect with us in a variety of ways. Like, follow, interact and share! The Via Volunteers App is packed with information - If you read something you might want to come back to later, save time by adding it to your favourites.